What is special about SJMF? Saint Joseph’s Mission Fund (SJMF), a non-profit corporation organized and operated exclusively for charitable purposes, is headquartered in Alexandria, VA. SJMF was granted 501(c)(3) status by the IRS in August 2002. 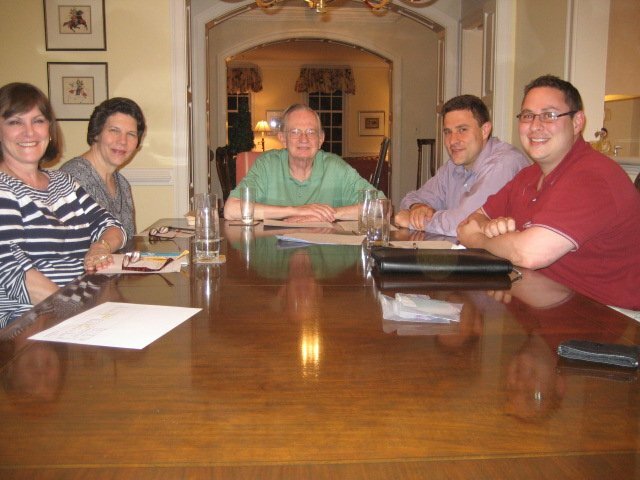 All officers and members of the Board of Directors reside in northern Virginia. 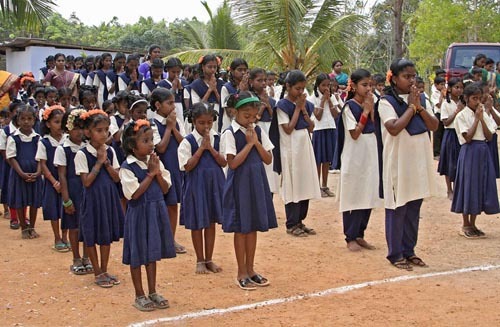 SJMF was formed and incorporated in April 2002, however its origins date back to 1989 when members of SJMF became acquainted with the severe living conditions in southern India, and this inspired them to provide assistance. 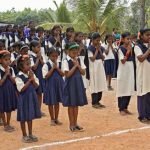 Over the intervening years, more than 200 people have provided financial support, through a variety of channels, to the destitute in the area of Vellamadam, India. In 2002, some of the most active supporters formed SJMF in order to provide a more effective, coordinated, regular stream of support, and to increase the number of regular donors. Saint Joseph’s Mission Fund is a charitable organization dedicated to providing basic necessities to the poor and disenfranchised in the most needy regions of the world. Our efforts have been directed primarily to the Tamil Nadu region in southern India, and more recently to the Assam region of northern India., where we provide support for orphanages and schools, an old age home, and assisting the poor in obtaining food, shelter and other necessities such as clean water.We also offer support to charitable organizations in Africa, primarily a home for children with AIDS. 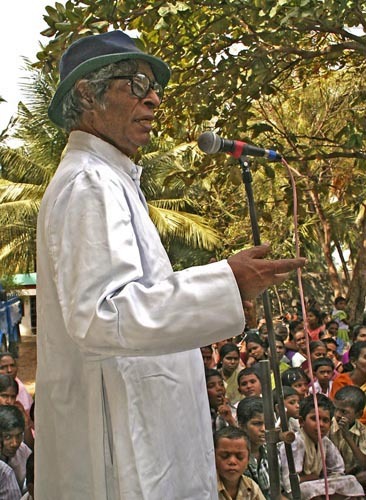 This work is accomplished through small, carefully selected and monitored organizations: three in southern India in Vellamadam which were founded by Father Joseph Swam (deceased 2007) whose work is carried on by his longtime assistant Rosammal Manuvel, one in Assam through a local priest, and lastly an organization in Kenya. to provide a means for supporting charitable and educational activities for poor and disenfranchised persons in underprivileged and developing nations. to contribute to orphanages, old age homes, refuge centers, and other charitable institutions that provide care, comfort, and support for the homeless and hungry of the world. to pursue activities in furtherance of the above stated charitable purposes and any other charitable activity that is consistent with our status as a 501(c)(3) organization. While the above accurately describes the purpose of SJMF, the primary underlying motivation for establishing the SJMF was an exceptionally strong desire by its membership to guarantee that the best possible use was made of every dollar donated, that all donations would go directly to the destitute without overhead expenses, and that these donations would provide specific and readily identifiable results in the foreseeable future. The needs SJMF fulfills are those specifically identified by local leaders and administrators in the poorest regions of the third world. These needs are either daily survival requirements, such as food and support for orphanages and an old age home, or aid which will permit the recipients to better their lives in the future. 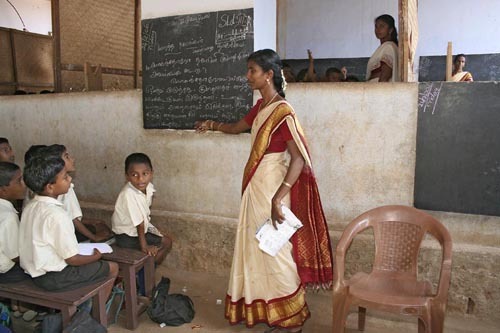 Examples of assistance in this category include drilling wells providing clean water, basic schooling for children, basic training for young adults in a skill to engage in cottage industries, creating an accredited Teacher Training School, establishing sanitation facilities and tackling similar basic life support projects. Additional and more detailed examples are provided in below paragraphs. Since 2002 when SJMF was formed, its donor base has expanded from approximately 150 to over 800 individuals with a resultant increase in meaningful support for the poor in India through the programs described herein. This expansion has been accomplished by word of mouth advertising, individual SJMF members devoting significant time and resources, a true “grass roots” effort and it has resulted in an enormous positive impact in India. Significant tsunami relief operations, responding to over 10,000 refugees in the immediate area. Rescued the last remaining elementary school in a nearby village, renovated the collapsing building, reestablished the school, thereby maintaining state support for three professional teachers, established a parallel orphanage operation and attracted over 100 additional students. Built the first sanitary facilities for the general public and for nearby school children. Created and outfitted a Teacher Training School intended for young adults emerging from the orphanages. Built low-cost homes for the homeless. Established and maintain a medical clinic. Established on-site reliable electrical power in order to sustain electrical lighting for student study, well water pumps and basic refrigeration of food. Expanding rudimentary micro-enterprise activities to support hundreds of indigent young women struggling to support their families. The nature of the programs listed herein, and the results of those programs, speak for themselves: Schools and a small hospital constructed, homes built, wells drilled, 100 orphans and 25 elderly housed and fed, hundreds of people trained, and many lives significantly bettered in a visible and measurable manner. Due to the success and positive impact of the SJMF, requests from India for additional assistance continue to build. Every dollar donated has been put to effective and good use. In the words of a visitor to Vellamadam in August 2005 “they really make a dollar go a long way over there”. SJMF Achievements Recognized: In 2007, SJMF was selected to appear in the Catalogue for Philanthropy publication. This catalogue recognizes the very best small charities in the greater Washington, DC region based upon factors such as merit, cost-effectiveness, and significant accomplishments. Competition to appear in the catalogue is keen, and SJMF is proud to have attained this recognition which will give greater visibility and assistance to our charitable work. Every dollar donated to SJMF goes to support the needy. No salaries or expenses are paid to anyone in the SJMF, and all overhead costs are documented but absorbed by individual members. Few charities can say that 0 % of donations are used for administrative expenses or fundraising activities, and that 100 % of donations go to achieve the goals of the organization. In addition, project costs in this area are much lower than other parts of the world. For example, the current cost of a 350 square foot masonry home with a solid reinforced concrete roof, fully plastered and finished to a turn-key condition, is $4000. The monthly cost of supporting one orphan (food, clothing, shelter, schooling, medical care, supervision) is $25 per child per month. SJMF is closely linked to the organizations that it supports through mail, email, visits to India by SJMF members, and visits by local leaders in India back to the United States. We know what is going on there, and specific feedback is provided to individual SJMF members in response to each donation. As a result, all members feel closely connected with the projects which SJMF funds through its monthly grants. Projects are normally undertaken in India as soon as the funds arrive from SJMF so the benefits to the poor are immediate. We know from experience that every dollar is well spent and greatly appreciated. The thought of a young widow with a child or two receiving a goat or some chickens which will impact their lives for years to come provides a sense of gratification that is truly unique. As a result of this high degree of connectivity with India, the number of donors to SJMF has steadily increased and permitted us to move on to larger projects such as building modest (350 square feet) houses for the poor and homeless, and to provide funds to support the daily needs of the aged and orphans on a regular and predictable basis. Father Joseph Swam was a good student from a poor family who caught the eye of his teachers and was provided the opportunity to get advanced education and to become a priest. 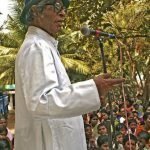 Ordained in 1956, he has devoted his life to helping the neediest people in the southern tip of India, regardless of their religious beliefs. He established his first school in Vellamadam in 1979, and the school quickly expanded to 1st-12th grade with 2000 students. He started his first orphanage in Vellamadam in 1983 with 18 abandoned children. The number quickly grew to 100 children ranging in age from 5 to 18. Despite poor health, and forsaking all opportunities for a more comfortable life, Father lived in the Vellamadam compound, seeing to the day-to-day operations of the mission. Some people have referred to Father Joseph as the “Mother Teresa of the South.” Given his devotion to his mission, this is not an overstatement. After more than 50 years as a priest devoting his life to helping the poor, Fr. Joseph died in India on March 7, 2007. St. Joseph, sometimes known as St. Joseph the Worker, is patron saint of families, fathers, laborers, pregnant women, social justice, unborn children, workers and working people, among others. An apparently quiet man (none of his words were recorded) of great fidelity to his wife and obedient to his God, St. Joseph provides us with a clear example of what we wish to be: quietly working to attend to the needs of children and families, and striving for social justice. 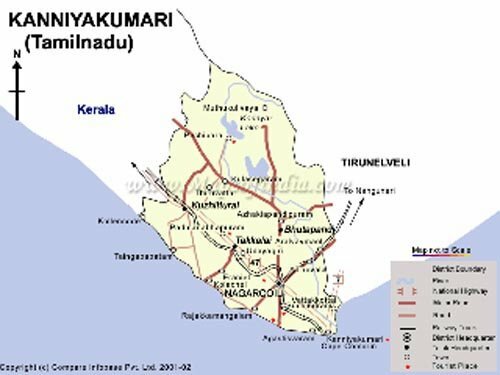 The Welfare Center is near Vellamadam in Tamil Nadu, India. The red dot on the map above shows the general area where Father Joseph established his missions. The orphanage, medical facility and other works at Vellamadam are only seven miles off of the coastline on southernmost tip of India. SJMF also provides assistance to the Adivasi people in the northeastern state of Assam, India. These people are primarily workers on the many tea plantations of Assam. The Adivasi are a very poor and downtrodden class who face daily discrimination in all facets of their lives. Father Caesar Henry is a Catholic priest, who works among the Adivasi people. His parish consists of 23 villages in a radius of 30 miles. The Adivasi people are largely illiterate, and were pagans before Father’s arrival as they had been without a priest for 20 years before he volunteered to serve there. The Adivasi were brought to Assam in the early 1800s by the British from Bangladesh as cheap labor for their tea plantations, and they have always been on the lowest rungs of the economic ladder in a nation which has a great percentage of its people in poverty. Historically they have been exploited by the higher castes, and have very little support from local authorities. They still work on tea plantations, and other day labor jobs, at a wage of about $1.25 per day, when work is available. Their children are often recruited to work in the large cities with false promises but, in essence, are used as near slaves, and deliberately addicted to drugs and alcohol to keep them dependent. Father Caesar has made amazing progress since his arrival 10 years ago. 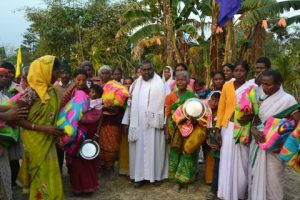 He travels from village to village, teaching religion, holding retreats, distributing bibles and prayer books, running educational programs for the youth, and organizing programs to improve the lives and living conditions of all the people. With SJMF support, his distribution of medicine and blankets to the poor during the cold winter months has saved numerous lives in the past few years. In July of 2014, 18 Adivasi villages were attacked and burned by a neighboring tribe in a land dispute which has existed for over 100 years. Hundreds of huts were burned, 12 elderly people who could not flee were murdered, and hundreds of livestock were stolen or killed in an effort to drive the Adivasi from their land. As of early 2015, the Adivasi have not been able to return to half of these villages due to continued random killings, and they have not been able to harvest much of their crops which have rotted. Local authorities largely turn a blind eye to the problem as they have no interest in the plight of the people. Fr. Caesar and his workers continue to assist the Adivasi as they recover from these attacks. They spread the Good News by example in providing material assistance to these impoverished people without regard to their religious beliefs. SJMF accepts donations on behalf of Fr. Caesar to assist in his work in Assam. Anand Khokha and Ms. Sandra Kunz, a professional photographer who specializes in children photography, are sponsors of Father Joseph’s work. All sales of photos taken at Father Joseph’s mission are donated to SJMF to support Father Joseph’s work. Visit Anand Khokha’s website to see their work at www.khokhaphoto.com.